Registration is open for UURAF, the University Undergraduate Research and Arts Forum. UURAF is an opportunity for students to showcase their scholarship and creative activity to the University community in a conference-like venue. Students present their work to faculty judges in an oral, poster, or performance presentation. Students need to register by Friday, February 15, 2013. 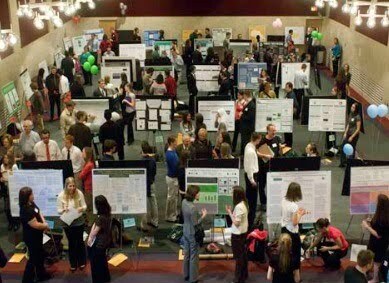 Registration and detailed information for participants can be found on the undergraduate research website at www.urca.msu.edu/uuraf. Students may participate as individuals or as part of a group. Due to space and time limitations, we strongly encourage groups to be no larger than 4 people. Students may participate in a maximum of two events. Last year, 561 students presented 415 programs at the event. It was an impressive display of student scholarship and talent. Please share this information with faculty and encourage them to have their students present their work at the forum. The opportunities for student participation are very broad. The forum will be held in the MSU Union on Friday, April 12 from 9 AM - 5 PM. For additional information, contact Dr. Korine Wawrzynski, Director of Undergraduate Research, at uuraf@msu.edu or 884-1559. We look forward to seeing you at UURAF.